Triglav is Slovenia’s amazing gem. Its only national park. Towering white cliffs and snowcapped peaks of the Julian Alps. Wild and incredibly blue streams. Lovely waterfalls. Fairy tale valley of Soča River. Magical reflections of Lake Bohinj. And we shouldn’t miss out Lake Bled either. But our favorite day was probably the one when we drove through the park by car. It was a perfect (almost) circle starting from Lake Bled and ending at Soča Valley with countless stops and shorter scenic hikes on the way. We spent the night in a small village called Spodnje Gorje (in Guest House Kuralt) near Lake Bled. The place is a mountain dream, quiet, serene and beautiful and we especially appreciated its calm atmosphere after busy Lake Bled. Moreover our host was a charming elderly lady who speaks the most perfect English we’ve heard while in Slovenia. 🙂 Getting there by car is not so peaceful though, driving on the narrow mountain roads is always stressful for us, but that’s something you better get used to when driving through Triglav. As part of our usual mountain routine we got up early in the morning and we were already on the road around 8 am. A long and beautiful summer day was ahead of us! 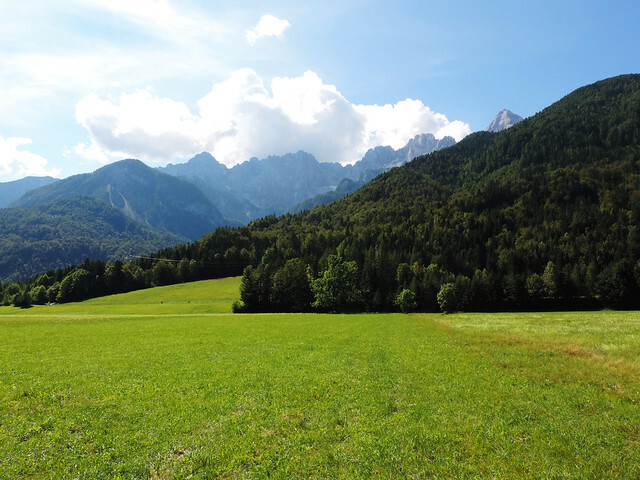 As we spent a whole day both at Lake Bohinj and Lake Bled previously we headed directly to Kranjska Gora which is in the northern area of Triglav National Park. But of course, Kranjska Gora was not the first spot to stop. 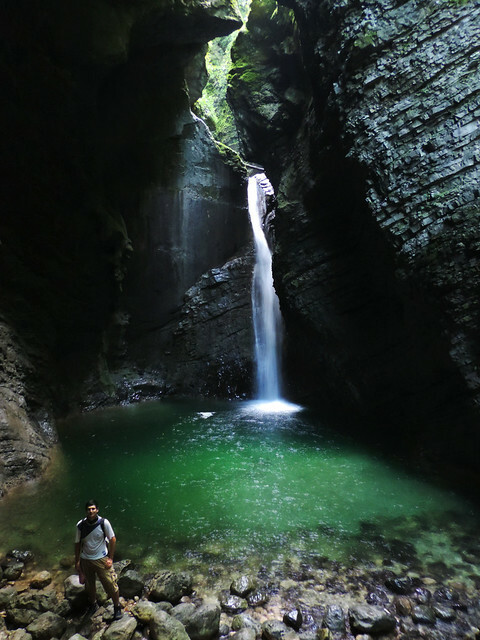 Our first stop was a lovely short hike to Peričnik waterfall (Slap Peričnik), our favorite waterfall in Slovenia. 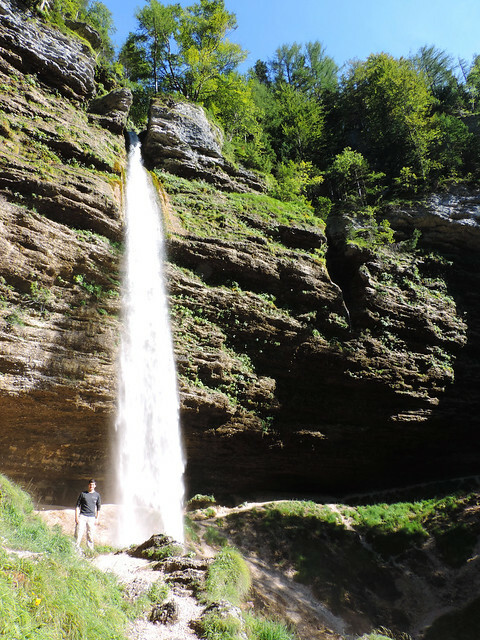 It’s hidden in the forest and it’s possible to walk behind this 52 metres high waterfall. You might get a bit wet but for us nothing compares to the view when millions of little waterdrops are sparkling in the sunshine! After having breakfast at Peričnik waterfall we got back to the road again. We stopped several times at random pullouts to enjoy the view and take some pretty pictures. Our next longer stop was Lake Jasna at Kranjska Gora. It would have not been possible not to notice such a magical lake right by the road! There are several smaller parking lots and parking is free. Several hikes start here (just like at every stop in Triglav), but we only walked around Lake Jasna and enjoyed the distant peak views. 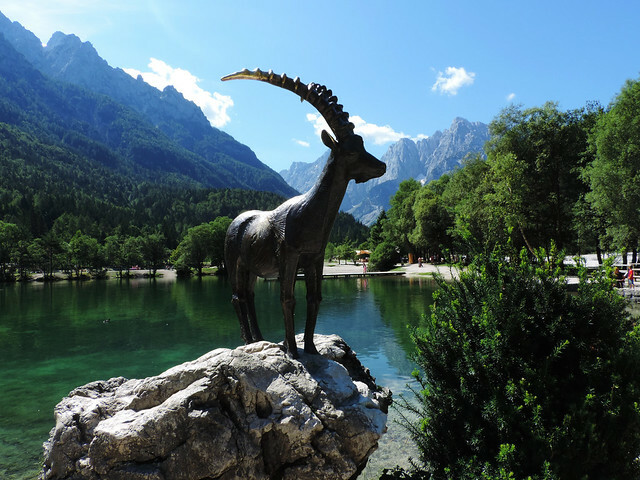 Oh, and we met Zlatorog (Goldhorn in English), a legendary chamois buck whose realm was in Mount Triglav. Our next planned stop was the Russian Chapel, a small wooden chapel up in the mountains built by Russian prisoners during the Second World War. It’s very close to Lake Jasna by car, but unfortunately it was closed to public on that day. We’ve seen a bunch of police cars around and later we figured out we were actually quite lucky. Because the chapel was closed due to the visit of the president of Russia on the chapel’s anniversary on the following day. And on the following day even the whole road through Vršič Pass was closed to traffic. We were happy to make it just in time. Guess we need to check for presidential visits in advance next time? The road to Vršič Pass was narrow, steep and basically it was a series of curves one after the other (they even have numbers). But driving through the heart of the Julian Alps was breathtaking! 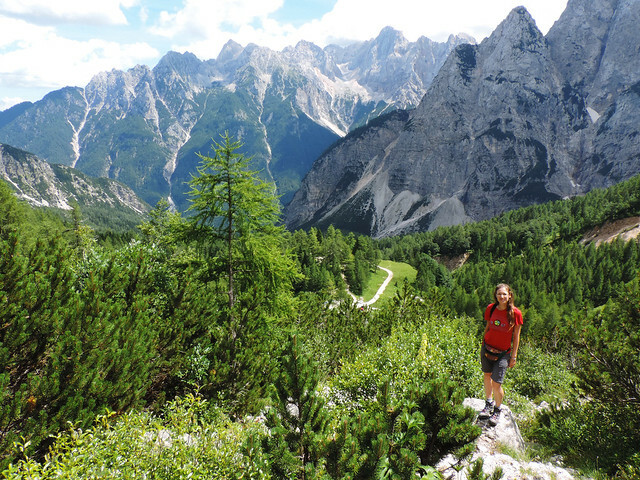 We stopped for a short hike to Slemenova špica which is probably one of the easiest and shortest hikes leading up to a 360 degrees panorama of the high peaks of the Julian Alps. It was very scenic all the way and the flowers up there have just started blooming so the end of July felt like early spring. After we climbed up to Slemenova špica our small car had to climb up to Vršič Pass finally. It’s the highest mountain pass in Slovenia with an elevation of 1611 metres and with an incredible view of the surrounding high peaks. From Vršič Pass it’s steep downhill with lots of curves and viewpoints. One of the most famous ones is at the statue of Julius Kugy, a Slovenian mountaineer. Then came the drive through Soča Valley. What should you know about it? 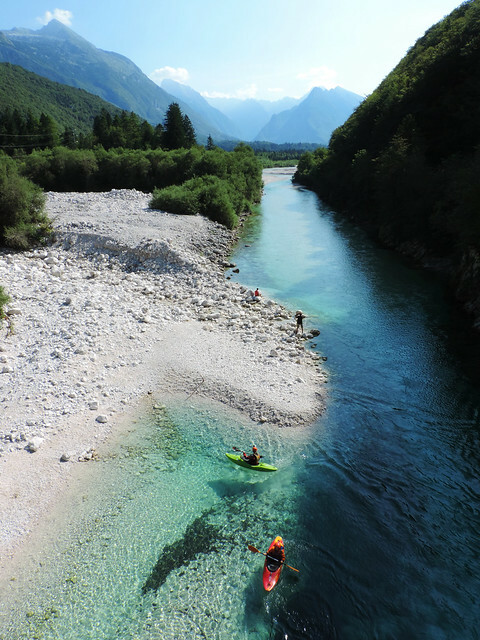 Soča River is probably the most beautiful river in whole Europe! It’s a crystal clear and magically blue river surrounded by picturesque peaks. Some of its sections are narrower and wild, some are wider and slower. There’s a long hiking trail all along Soča and the road also goes next to it most of the times. There’s a bunch of hanging bridges and nice picnic spots along the road. And occasionally waterfalls nearby. I don’t know how many times we stopped while driving in Soča Valley, we haven’t even counted. Two bigger waterfalls in Soča Valley are Virje and Boka. Boka Waterfall (Slap Boka) with the height of 106 metres is the highest in Slovenia. It can even be seen from the road, but there’s also a short walking trail to a viewpoint. It’s not possible to go close to the waterfall though. Virje Waterfall (Slap Virje) is smaller and also a bit more hidden, but you can go really close to it – even swim in the pools. Okay, they are damn cold, of course, but it’s quite a pretty pool! 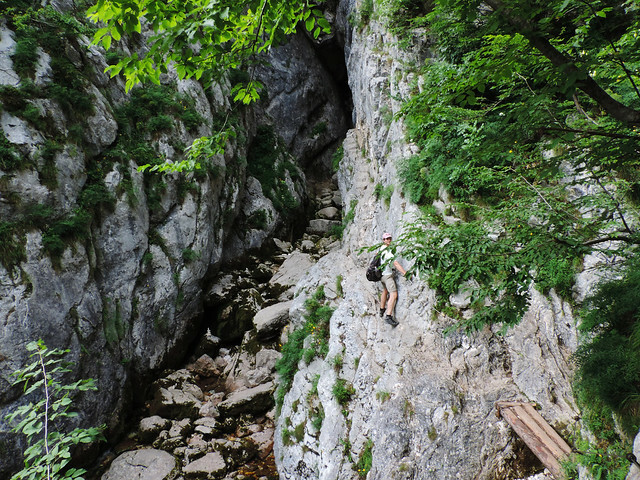 There’s a short trail leading to the waterfall from Plužna. We finished our long-long day in the town of Kobarid where we booked our accommodation in advance. Actually, visiting Virje and Boka waterfalls couldn’t even fit in that day, we drove back to them the following day when we also did a longer hike in Soča Valley. 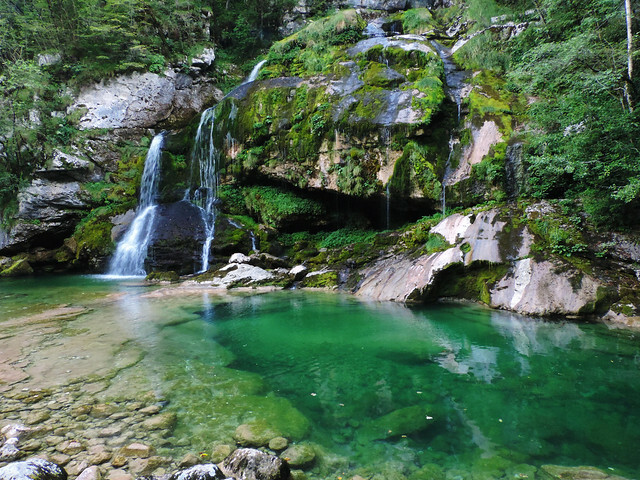 Another charming waterfall close to Kobarid is Kozjak Waterfall (Slap Kozjak) which is our favorite in Soča Valley. It’s hidden in a narrow canyon and we could reach it with an easy 20 minutes hike through the forest. 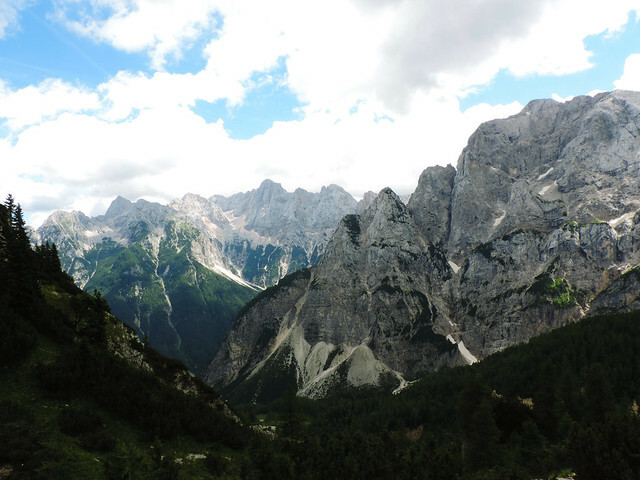 Is it worth driving through Triglav? Our answer is a confident yes. Even a one day drive is enough to complete the route from Bled to Kobarid and get a taste of the beauty of Triglav National Park. Altogether we spent 5 days in the park, but we still feel we’ve only got a taste of what it has to offer. Driving was a bit scary though. Roads are steep and narrow. Very narrow. We state it as the owners of one of the smallest cars possible. And the drivers… well, not all of them drives carefully, let’s put it that way. And that’s far more scary than the roads. 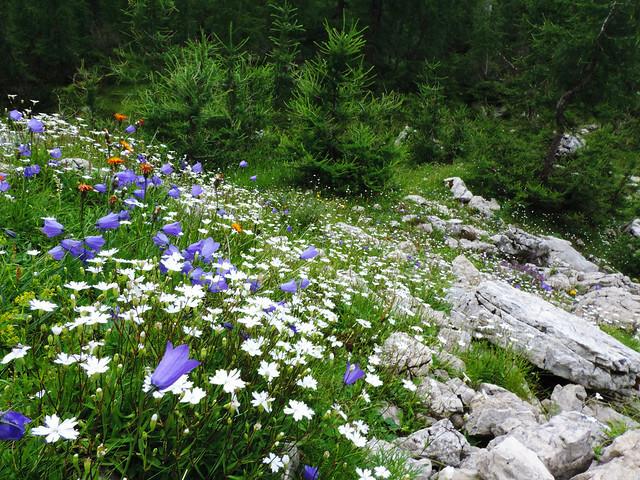 But the beauties of Triglav made us forget all of our concerns once we were out of the car. Planning your trip now and looking for great rental car deals? You can start here! Wow, what a stunning area of Slovenia! I have to add this to my itinerary when I finally get there! So nice to read more about Slovenia’s scenic beauty beyond Lake Bled! My favourite drive is the Gros Glockner Pass in Austria… that is so amazing that I do it every time I go to that area of Austria! Also the Icefields Parkway in Alberta, Canada between Banff and Jasper. Stunning scenery! 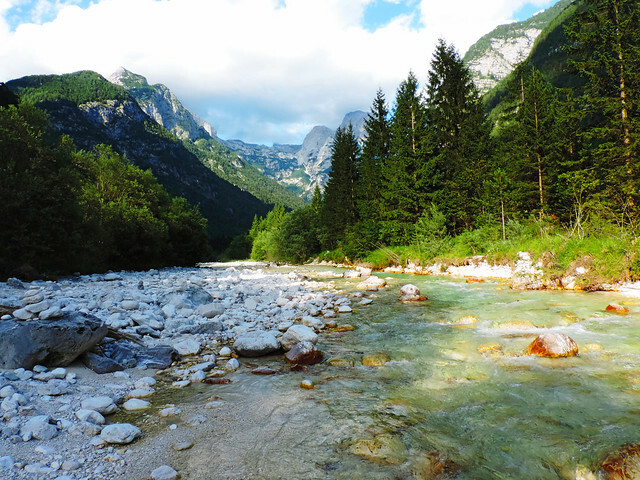 Soča Valley and other more remote parts of Triglav are definitely worth a visit! They don’t have the crowd but have the beauty. 🙂 Oh, the Icefields Parkway, Banff and Jasper are still dreams we want to fulfill! Thanks for reading, Tilly.